I'm back again featuring the perfect bun bow by Gina Made It. I enjoyed my bun bow over the summer time, but now, I'm enjoying these festive bows for the holiday season. They're a delicate touch to an up-do that will accompany your party attire. My Brocade dress and the teal velvet bun bow were a match made in heaven. Also perfect for the season are the taffeta bun bows. I chose to dress this bow down at bit as I wore it with my puffer vest. Taffeta or velvet, either is the perfect touch of class and sophistication to an every day or party outfit. 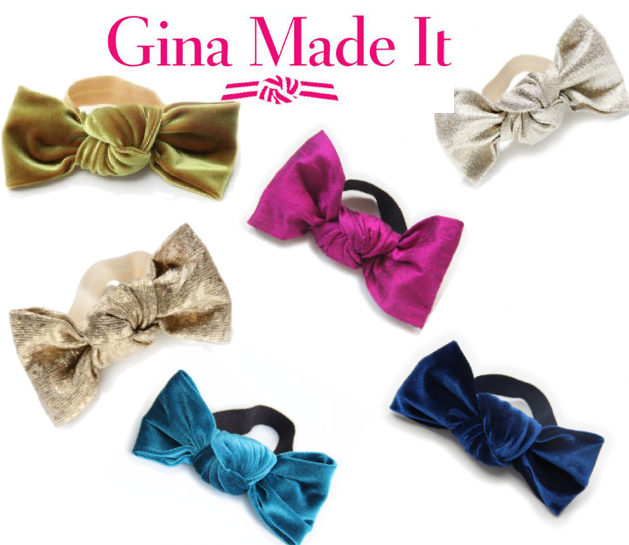 The options are endless with Gina Made It's Bun Bows! To see more inspiration, hair style ideas, and newly added items, you can find Gina Made It on Instagram, Facebook, Twitter, and Pinterest. Bun Bows are the ideal Christmas gift also! How would you style a Gina Made It Bun Bow? Aww you styled that so well!! Is that your home? It is gorgeous!!! I will be there in VA in a few week! So pretty!! I love your dress, it is so beautiful! The Gina bow is really cute! You look gorgeous! That dress is beautiful and so is the location! !